[Photo from you-are-here.com] Bartender Aaron is super nice but soon he will need a job. Drinks're $4 but very weak. Keep drinking and going to the restroom. It's very bright inside for a bar and been there for 30 years or so I think? It's clean and very comfortable to kick back with some friends with a beer. It's spacious. Dinner companion even pulled his suitcase in right after getting off the plane which I don't think we could have found another spot as relaxed as that. Everybody minds their own business. They're closing the end of this year because of some plausible plot (One time a guy went in and later LAPD said that guy was a suspect and influenced no renewal of lease; owner decided not to fight cuz he knew he'd still have no lease). I'm very disappointed this kind of business of so much history is forced to close. Wonder what's next to take over that desirable spot right next to so many expansive loft buildings where the landlord can probably make much more than how much they do now with that mysterious "suspect" deal. The message of the story is don't order delivery: the Pitfire dude comes in then tomorrow your home's cracked down cuz he's a "suspect", you never know. Okay, there needs to be a get together at Craby Joes, during the day, before it closes. A B, I don't understand your question? 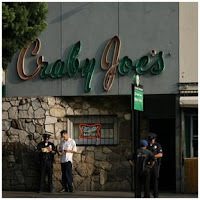 Well, don’t you think we ought to have some sort of going away party for Craby Joe’s? It’s either going to end up going “hip” or turned into some retail store. Whoever“hip” retail takes over it later, you know how they get there. Have you heard anything on Coles? Before the month is up, I'm going to try and hit Craby Joe's and King Eddys Saloon. If you google Bashardoust brothers, you'll see me and my brothers. I'm in the Monkees t shirt. What's King Eddys Saloon? Closing? You don't remember I was the bikini girl behind you? I don't think King Eddys is closing. I remember the bikini well! Yes. I'm 46, my middle one is 41, and the youngest is 39. We were all born in Los Angeles.